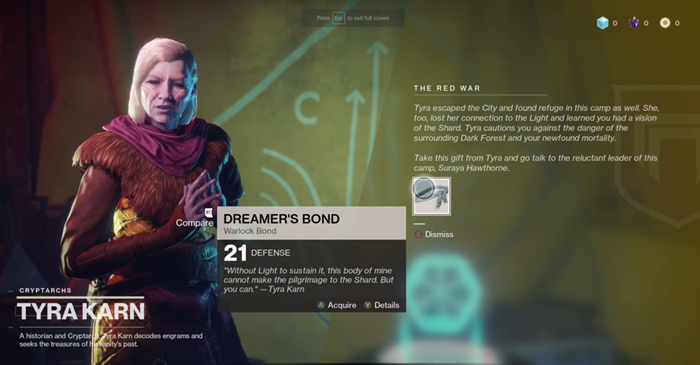 This page contains a walkthrough for Mission 2 Adieu in Destiny 2, including strategy guides, obtainable weapons, armor and items, and enemies encountered. 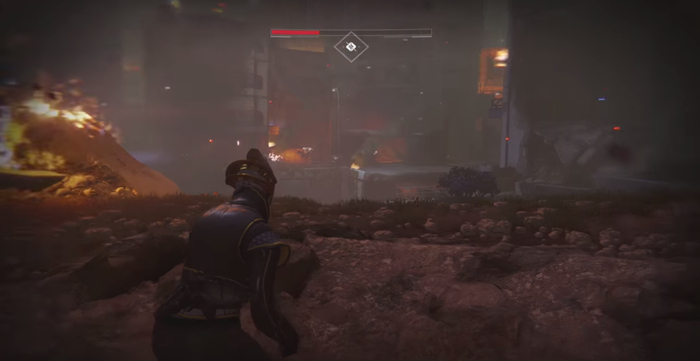 Mission 2 Adieu is the second mission of the main story in Destiny 2. The Guardian escapes the ruined city overrun by the Red Legion and heads for the outskirts. When you regain control of your character, head for the buildings marked by enemies marching up ahead. Descend down where the concrete bridge has been destroyed. When you get down, turn right towards the pipe hanging from the bridge. Continue following the path of ruble there. You will be healed by a Ghost Shell when you are near the tunnel. Then, enter the tunnel and follow the path again. You will reach an open area towards the mountains and will come to the City Outskirts. When you are in control again, you will see a falcon perched on a rock. Follow its direction. On your path, you will see a metal pole with a red cloth tied to it. 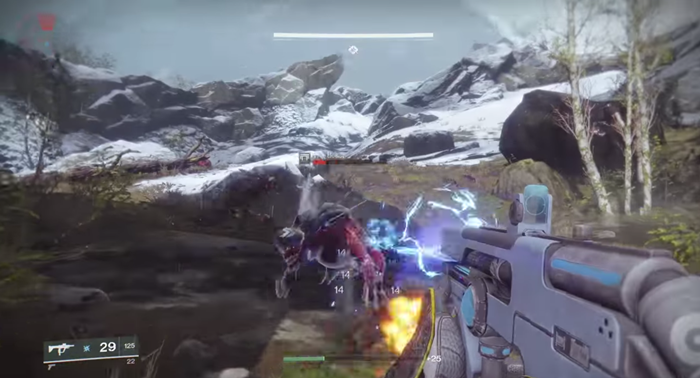 Jump down to the area littered with ruin and dead guardians. Move forward and you will obtain a Submachine Gun next to a corpse. When you proceed forward again, you will encounter a pack of War Beasts (and one Honored War Beast). Take them out. Be careful not to let them come near you in groups. Kill them one by one from a distance. Then, continue forward again. Continue following the falcon towards the snowy path ahead. Be careful when walking on the narrow walkway of the mountainside or you will fall off. You will see the falcon again as you climb down the mountain. Follow the falcon’s direction that turns left. When you get to the open area, you will be attacked by War Beasts and a Legionary. A good tactic is to go to run to where the Legionary first spawns and take him out quickly. You can then kill the War Beasts much easier. After defeating the enemies, proceed forward again. You will arrive at a descending path that leads to a tree trunk bridge. 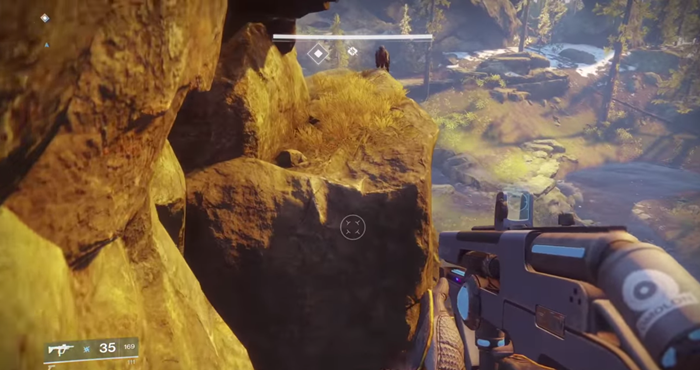 You can walk across or use the narrow ledge on your right. You will arrive at a somewhat wide gap that you need to jump across. If you don’t time your jump correctly, you will fall and die. On the other side of the mountain, you will need to make another jump. This time, you are not supposed to make it since it is part of the story. A cutscene will play. You will soon arrive at the Farm. This area serves as a hub to access mission, use the Vault Terminal, fit your character with with new weapons and armor (Overseer Hawthorne and Postmaster Darbi 55-30) or decode engrams that you obtain through other missions (Tyra Karn). When you are ready, open the Director menu and proceed to the next story mission – Spark. This concludes the Mission 2 Adieu walkthrough for Destiny 2.